Theresa M. (Henehan) Monyak- of Connecticut, formally of Woburn, March 19th. Devoted mother of Corinne and Miranda Monyak of New Hartford, CT. Beloved daughter of Esther (Girardi) and the late John Henehan. Cherished Sister of John J. Henehan, Jr. and his wife Kathleen of Andover, and Colleen M. Henehan and her partner Peter A. Hersee, Jr. of Winchester. Loving aunt of Cody, Kaela, Derek, Ava and Brooke. Dear daughter-in-law of Doris Monyak of CT. A funeral will be held from the Lynch-Cantillon Funeral Home, 263 Main Street, Woburn, on Wednesday, March 27th, at 10:30 a.m., followed by her funeral mass in St. Charles Church, 280 Main Street, Woburn at 11:30 a.m. Internment will take place at the convenience of the family. Relatives and friends are respectfully invited to calling hours, Tuesday, from 4-8 p. m. In lieu of flowers, donations may be made in Theresa’s name to the Dana Farber Cancer Institute, 450 Brookline Avenue , Boston, MA 02215. A “Celebration of Life” will be held on Saturday, March 30th at 11:00 am at Chatterley’s Banquet Facility, 371 Pinewoods Road Torrington CT.
Theresa M. “Terry” (Henehan) Monyak- of New Hartford, Connecticut, formally of Woburn, died peacefully, Tuesday, March 19th at Brigham and Women’s Hospital, surrounded by her loving family. She was the devoted mother of Corinne and Miranda Monyak of New Hartford, CT.
Born and raised in Woburn, Theresa was the beloved daughter of Esther (Girardi) and the late John Henehan. She was a graduate of Woburn High School and received her bachelor’s degree from Merrimack College. For many years, Terry worked from home as a loan processor for Fairway Independent Mortgage out of South Boston. 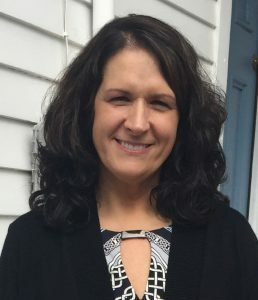 She also previously worked as a substitute teacher and at a paging company when first moving to Connecticut. Terry lived her life for her daughters, and they were always her number one priority – making endless sacrifices to take care of them, and provide great care, guidance, morals and love. Her and her daughters shared a love for music and performing, once being members of the choir for the Immaculate Conception Church of CT. Even through illness, she was able to enjoy a Cruise where they swam with dolphins and more recently, a visit to the Zoo in Washington, DC to see the Panda Bears. Theresa’s favorite holiday was St. Patrick’s Day. She lit up at the sight of shamrocks and anything green. She had a sense of humor and told jokes that her daughters didn’t always think were funny but would laugh at anyway. Her family and friends will miss her generosity, unconditional love, support and hugs, but will cherish the memories they made with her forever. Along with her daughters, Corinne and Miranda, Theresa is survived and will be deeply missed by her mother, Esther (Giardi) Henehan of Woburn. Cherished Sister of John J. Henehan, Jr. and his wife Kathleen of Andover, and Colleen M. Henehan and her partner Peter A. Hersee, Jr. of Winchester. Loving aunt of Cody, Kaela, Derek, Ava and Brooke. Dear daughter-in-law of Doris Monyak of CT.
A funeral will be held from the Lynch-Cantillon Funeral Home, 263 Main Street, Woburn, on Wednesday, March 27th, at 10:30 a.m., followed by her funeral mass in St. Charles Church, 280 Main Street, Woburn at 11:30 a.m. Internment will take place at the convenience of the family. Relatives and friends are respectfully invited to calling hours, Tuesday, from 4-8 p. m. In lieu of flowers, donations may be made in Theresa’s name to the Dana Farber Cancer Institute, 450 Brookline Avenue , Boston, MA 02215. A “Celebration of Life” will be held on Saturday, March 30th at 11:00 am at Chatterley’s Banquet Facility, 371 Pinewoods Road Torrington CT. I was shocked and saddened to learn of Terry’s passing this morning. I knew Terry from my younger days working in Winchester for my father and her working at the bank. Her infectious smile, laughter and wonderful sense of humor always brightened my day. She was an absolutely lovely person in so many ways. I wish to extend my deepest condolences to her family and friends at this time of loss. Corrine and Miranda, speaking from my own experience, I pray that time will diminish your bereavement at losing a parent so young. She will be with you and the rest of us in spirit. do anything to support you all. With love. Everyone who knew your mom knew you girls were everything to her. We are all so sad for you and pray for peace for you as you grieve. She will be deeply missed and always remembered. Esther, Colleen and John and families – you are all in my thoughts and prayers. My sincere condolences.. I will always cherish the fun times I had with Terry at Merrimack and beyond…May she Rest In Peace…. Corinne & Miranda – our deepest condolences on the loss of your mom. Her bubbly personality, kindness and beautiful smile will live on in each of you. Our prayers are with you and your entire family at this difficult time. My deepest condolences to the family and the precious children. Terry was a mentor to me when I first started working with her and I’ll never forget the extra time she spent with me to help me along. She always did it with a smile in her voice . She will be truly missed. Dear Esther and family, so sorry for your loss. God bless you and help you through this most difficult time. condolences to your sweet girls and your entire family. Rest easy my friend. I love you. Corinne and Miranda my heart goes out to you both. I loved the time I spent with your mom while you and Aran danced at Miss Donna’s. Everytime I saw her after that she always remarked on how big the twins were getting and with genuine affection asked how Aran was doing. She always made me smile. God Bless you both. We certainly had some memorable times over the years of our valued friendship. You will truly be missed by many. My condolences to all the family and friends.